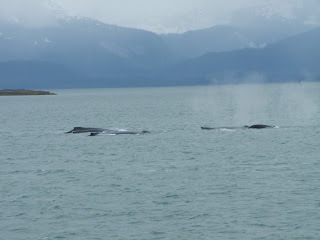 Over the summer, I had the opportunity to partake in a little Whale Watching in Juneau, the capital city of Alaska. The area is home to significantly large numbers of Humpback Whales, a beautiful animal, but one which generally lives its life alone, with the exception of a mother and calf. 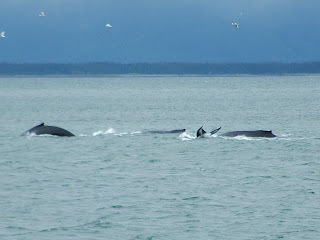 However, on occasion, in only six areas in the world (all in Alaska), Humpback Whales abandon their solitary life and co-operate in search of food. The result of such a collaboration is the phenomenon known as Bubblenet Feeding. A group of whales working together will dive under schools of herring, one whale will swim in a circle while blowing bubbles under the herring. When the bubbles rise they form a net and scare the herring into a tight ball in the center. 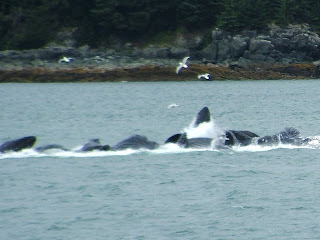 The whales then come up through the middle with their mouths open, capturing large amounts food. An average group size is 5 to 8 animals and but I was exceptionally lucky to see 10 whales in the feeding frenzy. While they are searching for their prey the whales communicate with each other with a series of calls similar to the whale songs. 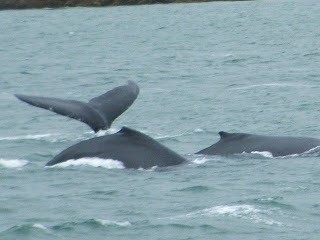 These usually culminate with one loud blast to frighten the herring just before the whales break the surface. The captain of the boat dropped a hydrophone over the side to listen in, adding to the excitement of seeing this amazing performance. Here are some of the photos I took. My camera isn't great but it was one of the most amazing events I have witnessed. 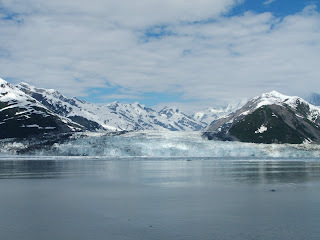 Here's a quick pic of the amazing Hubbard Glacier, in Glacier Bay Alaska. The Hubbard Glacier is one of the only glaciers in the world that is actually growing. It is an impressive 122km long and when it meets the sea, is over 6km wide. It stands at a heights similar to a 20 storey building!